How to improve Software testing skills, how we can do better on tests, Software testing process, how to study software testing and start your career. A brainstorming session with the team is always a learning experience. This time, we had a different idea. We divided the team into two groups and decided to ask questions to each other for a common product – Phone. The only restriction was the questions should be limited to testing of the phone. And the session ended with interesting unanswered questions and some better ideas to test the phone. Challenges are normal. It is when you look at them as opportunities, a gold mine and as obstacles, a land mine. I have had my share of ‘opportunities’ over the years in the IT industry. Some came with the role I was playing, some general. This is my attempt to record them and to reach out to the community to see if any of those resonate with you and maybe, in a small capacity help you and let you know that you are not alone. Is Domain Knowledge Necessary for a Tester to Get a Job? Then What About a Novice Tester? When you appear for a software testing interview as an experienced professional, even though your CV reflects total years of experience, but still the interviewer will ask ‘What is your total work experience?’ and if the hiring is a project based hiring, you will definitely be asked about your experience in that particular domain. The Years of Experience does matter since that becomes a decisive factor for the role, salary etc. but why do they focus and give so much importance to the domains? Does it mean there is a direct impact on the output if a domain expert is hired in the team? To know more, read this article, I hope this will give you a good insight into the importance of domain knowledge. Read moreIs Domain Knowledge Necessary for a Tester to Get a Job? Then What About a Novice Tester? In the world of software testing, a defect once found should be consistently reproducible so the tester can report with conviction, a developer can fix with clarity and the QA team can close with confidence. However, this process sometimes comes with its own set of challenges. This article tries to illuminate those dark areas of defect reproduction. First of all, what is “Reproducing a Defect”? Is daily project routine work enough for your success? We all love success and we know there are certain keys to get it. All we need is to find these keys and follow them properly. Many of us even know about these keys but find it hard to follow as we just don't want to come out of our comfort zone. We are OK in following our daily routine in which we have molded ourselves. There is a general thinking in IT industry that you need to be allocated to a project in order to prove your abilities. With this myth, we work for months or even years and keep ourselves busy in a daily routine that we hardly get any time to prove yourself. He announced his desire and parents, busy in talking, agreed upon it. When the pizza was served, the toddler started using chopsticks and was failing a number of times in getting the pizza in his mouth. Suddenly the parents noticed it and ordered the toddler to not use chopsticks. Toddler did not convince as the parents had already agreed upon his desire earlier. 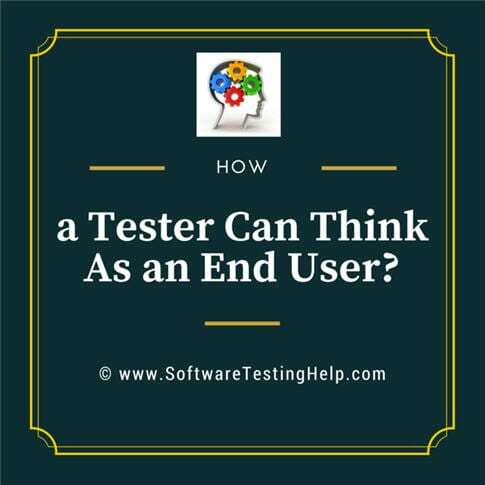 Read moreHow a Tester Can Think As an End User?